Thai Volunteer Ministers help prepare food boxes for distribution to those stranded by floodwaters. 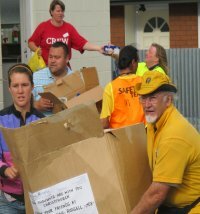 Scientology Volunteer Ministers are providing relief in Bangkok, Thailand, where flooding has affected some 3 million people. Volunteer Ministers from the Church of Scientology Mission of Bangkok are working with other relief organizations to cope with the needs of those at a temporary shelter at Chon Buri College where more than 4,000 evacuees were moved to two weeks ago where they cooked and distributed food and provided Scientology Assists.